Indochinese dishes are the ones prepared using the Chinese cooking methods using the Indian ingredients, a fusion , accepted by most of the Indians world wide. Vegetable Chow mein or noodles is my kids’ favourite, preferred any time of the day.As they are pure vegetarians( not allowed to stir in eggs either ;)..I go chop chopping the veggies...and once this part is done, the preparatory becomes simple and interesting. Here’s my version of it..
Noodles –a 200gm pack -I used Savorit Brand which is 100% veg. Boil a litre of water in a large pan.Add salt.When it bubbles and swirls, add noodles.Reduce the flame to medium and close the pan with a lid.Cook for 4-5 minutes or until they are ‘just’ soft.Take care not to over cook.The cooking time depends upon the quality of the noodles and the softness of the water.Drain the noodles to discard the water completely.Keep the noodles along with the drainer under a running tap of cold water.Drain the cold water and add a tbsp of oil and mix it along gently using your fingers,as the noodles must have turned cold by now.This helps to keep the strands separate and glossy. Heat 3tbsps of oil in a large wok,sauté onions for a few seconds, add ginger, garlic and sauté again.Now add the vegetables(carrot, cabbage and capsicum)and sauté for 2-3 minutes, keeping the flame high. (This is imp when it comes to chinese method of cooking).Let the vegetables be crisp or just cooked and not too soft. Add the soy and chilly sauces, aji-no-moto and mix well to the vegetables.Add the cooked noodles and mix altogether.Sprinkle pepper powder and check salt.Garnish with spring onions and serve hot with Gobi Manchurian / Mushroom Munchurian any Indochinese sidedish. The first picture is my entry to Click, the very own event hosted by Jai and Bee. This is also my submission to Margot of Coffee & Vanilla who is hosting Vegetarian Awareness Month. A day for Ladies, with the yellow sacred threads, kumkum, flowers and the Kalasam with the face of the Goddess atop, decorated with jewellery and flowers is a never to miss sight.Offerings or Neivedyam like white payasams, tamarind rice and some traditional sweets are made for the goddess Varalakshmi along with the offerings of fruits, coconuts and betel leaves and nuts.Pushparchanai or flower offerings is done along with the sacred Ashtothram chants with the 108 names of the Goddess!. The day falls on a Friday, every year according to the Tamil Calendar. I had posted about Varalaksmi vratham a few weeks back, giving importance to Arisi Upma or Raw rice Upma.Find the recipe and details here. 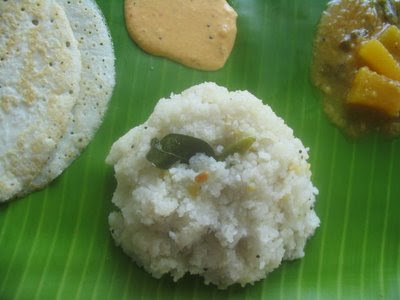 In this post, let me add along the recipe for the Dosai and the accompanying Chutney which were again the part of the main menu for the day..
Pacharisi / Raw rice dosai. Fermentation for the Iddly or Dosa batter requires 8 to 10 hours in normal room tempature of 25-30deg C. Parboiled rice and Urad dal in the ratio 4:1 is generally used for the purpose. 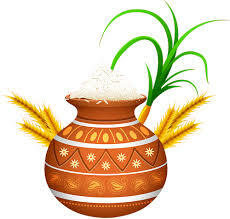 When it comes to the day of "vrutham", raw rice(pacharisi)becomes the substitute.Fermentation is avoided as it is considered “making ready the previous evening”and believed to be “unfit”!!. Therefore the soaking is done early in the morning for an hour on the same day and ratio for the raw rice and the urad dal would be 2:1 so as to acquire preferably a “softer” output :)..
Soak together, rice and dal for an hour and a half.Grind it to a smooth batter using the required amount of water,just as you prepare the normal idly or dosa batter. 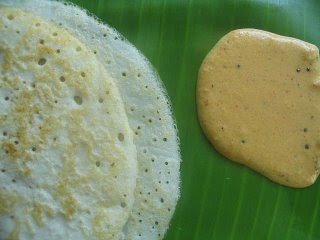 .Spread the batter on the hot tawa, meant for making dosas. Let the dough be slightly watery .Pour along in a circular way and avoid spreading into flat circles using the back side of the round ladle as you make the normal dosas.Just “pour” round and it spreads itself.Take care to fill the gap and resemble a dosa J..Flip over and cook the other side.Try to make soft and whiter dosas as this batter has the chance for making dosas harder.So avoid overcooking on the griddle or keep on flipping over and over. 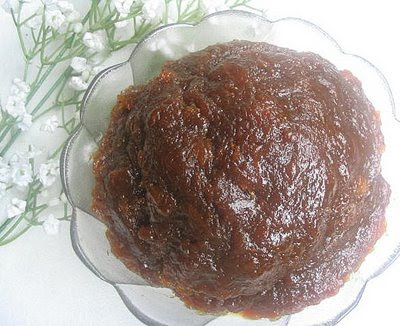 Kadalai paruppu / Bengal gram dhal Chutney. 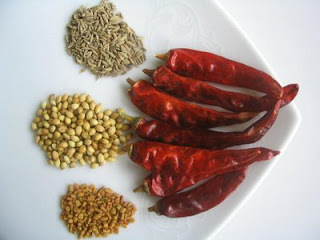 Heat oil for roasting in a kadai.Roast the dhal till unform golden colour.add the chillies and fry for a few seconds.Remove from fire,transfer contents to a flat dish and cool.Grind with salt adding enough water.See the picture for the consistency.Heat oil and temper using the mustard seeds and urad dal.Add hing and curry leaves.Pour it over the chutney and serve with the above hot dosas.Do not attempt to heat up the chutney. Sambhar was also prepared, with pumpkin pieces in it. I am not going in depth with the recipe of Sambhar here as Viji had requested us to avoid regular sambhars or rasams :). The recipe is already posted here. The only difference with the sambhar recipe is that, onions are avoided for the day or on any such auspicious days. 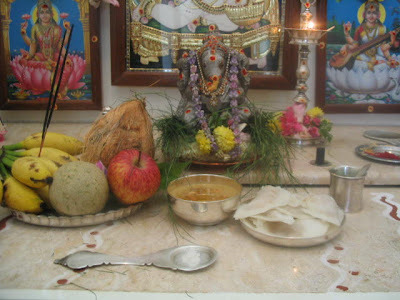 The food is served on a banana leaf soon after the morning poojas and women generally skip lunch or dinner as they observe fasting for the day.. This goes to RCI-Tamil festivals hosted by Viji of vcuisine. 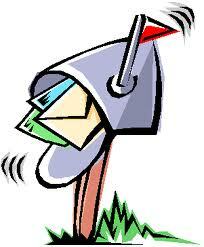 Three cheers to Jai and Bee for initiating this great event of "Click"!! Time to celebrate too!! Happy Ramzan!! 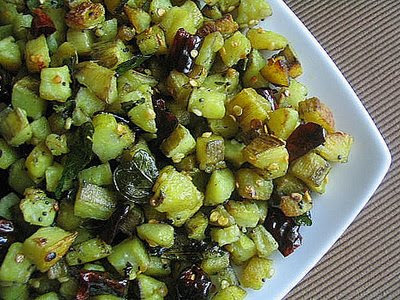 Soon after finishing editing this post I was unusually prompted to search the versions of the same in blogosphere.I did find a few fine recipes of Chakka varatti, but very few in all, which made me realise that this is certainly a ‘not-so-common delicacy’, of Kerala Of course, which has yet to be tried by the bloggers.. Together we started chopping the ripe fruit bulbs, which was not an easy job..(she was particular ‘not’ to churn up in a mixer and wanted the tiny bits undissolved in the end product! 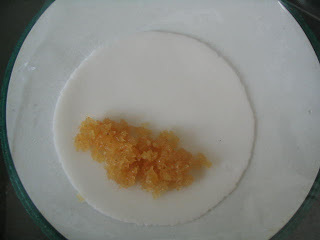 ), and proceeded to the other ingredients.’Coconut’ was avoided as we prefer without them.The mixing part was done alternatively by her and me in a 7 lt Prestige pressure cooker body.Supposed to be done in Uruli but we avoided that too as it might bring the hazard of spurting all over while boiling the fruit mixture. 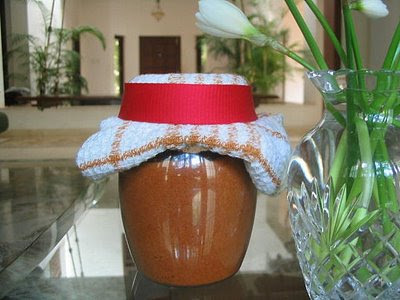 After about 1 ½ hours of exertion, we came up with a kilogram of the real traditional Chakka Varatti!! !...it tasted great and was worth the effort!.. Yielded 1kg, Time to prepare 1 1/2 hrs :D.. Ripe jack fruit bulbs-chopped-6 cups(we used Varikka chakka which is preferred.Refrain from Koozha chakka as it tends to be more fibrous). 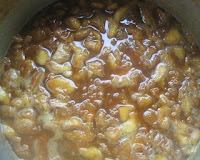 Pressure cook the jack fruit pieces in 3/4 cup of water until 4-5 whistles.In the mean time, melt jaggery in ½ cup of water till it becomes slightly thick.Filter impurities and add on to cooked fruit.Bring to a boil,this mixture and keeping the flame medium, keep on stirring….on and on.. adding half the quantity of ghee while stirring ..on and on..:)..continuously …( go for a long handled ladle with a flat end so that to have your hands safe from the hot splutters when the pulp boils and bubbles over)…stirring on and on...:).almost .for an hour and a half..:)..till it spreads a wonderful ar oma and rolls out to a dark soft ball leaving the edges of the vessel.Add the remaining ghee and mix well along with the cardamom powder. The darker the hue,the richer the taste and longer the shelf life of the preserve. The three pictures here represent the stages of preparation in half an hour intervals. 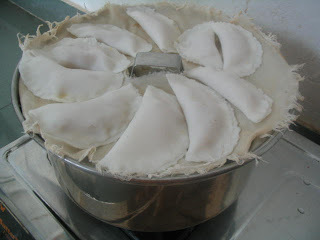 Chakka pradhaman(the diluted payasam with the addition of coconut milk) , Chakka ilayappam(steamed dumplings with the fruity filling, wrapped in banana leaves)and Kumbil appam(steamed in Bay leaves as cones....to be posted soon) are mostly prepared using the above Chakka varatti/chakka vilayichathu as the base ingredient. Jai & Bee of Jugalbandi announced JFI-Jack fruit.Unfortunately I could not be a part of their fabulous round up as I had been away, holidaying. I dedicate this post to you Bee..
Never been up with a guess game so far!.. 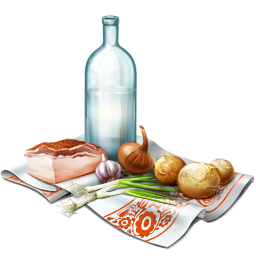 :D..Can you guess the food in the picture? 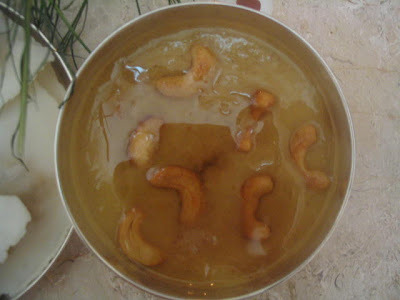 Kozhukkattai and Paruppu payasam for Vinayaka Chathurthi. Ganesha is the first to be worshipped, whenever we start anything hoping to go well.He in turn relieves us from the difficulties and solves our problems. Vinayaka Chathurthi is celebrated in the month of Avani on chaturthi (4th) day which comes after the new moon. As always, I headed to the kadai veedhi, the previous evening to get the Mun Pillayar/Clay Ganesha, yerukkampoo malai , arukam pullu, vilampazham, and the other fruits, the decorations like thennanthoranam, vazhaikkannu, chandanam and kumkumam.Then with the last minute shopping of vellam, yelakkai and the milk packs. 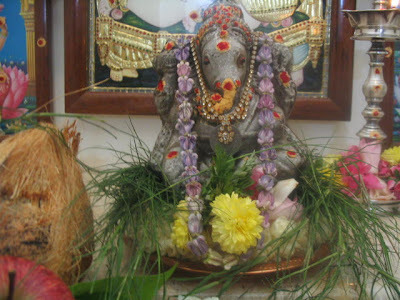 The Mavilai thoranam was put up from leaves of the front yard mango tree and the pooja room was made the previous evening. 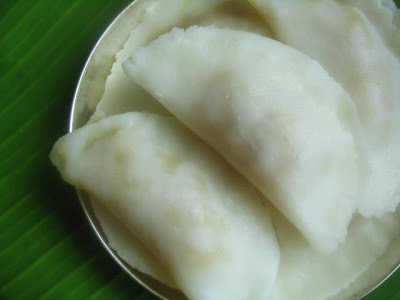 On the day of Vinayaka Chathurthi I prepared Kozhukkattais/Modakams and Pasipparuppu/Moong dal payasam as neivedyam. Raw rice powder is specially prepared for neivedyam a day ahead.Soak one kg ponni raw rice for half an hour in water.Drain and dry grind. 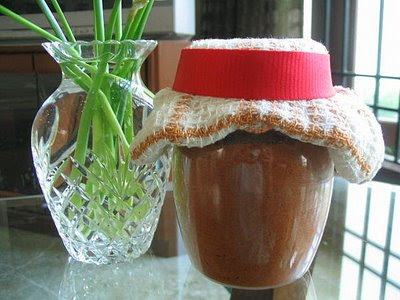 Crushed jaggery-half the quantity of the grated coconut,loosely packed in a measuring cup. 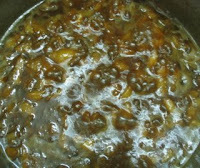 Fresh ghee-Atbsp(Reserve half of this to grease fingers and palms while making kozhukkattais) . Heat half the tbsp of ghee in a non stick kadai.Add the grated coconut and the crushed jaggery together.Sauté for a few minutes to melt down the jaggery pieces and steam off the water content. Mix in Cardamom powder. Keep this aside. For the safer side, to avoid lumps, I suggest the less exp cooks like me to mix the rice powder with 2 ½ parts of water directly, in a round thick bottomed vessel.Add oil and transfer the vessel to the stove top in medium heat, bringing to to a boil stirring all the time.The dough soon thickens to form a soft ball.Close the vessel with its lid to enhance the final cooking for a few more minutes keeping the flame to minimum.Transfer the dough to an appropriate casserole.The warmer the dough, the easier to proceed. 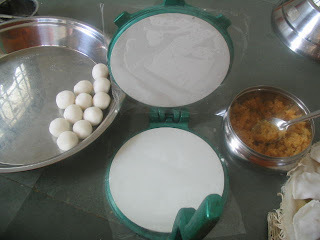 I prefer making them with the “poori dough presser” as it has proved handy and easier for anyone who has to proceed single handed. I line the presser up and down with two square pieces of polythene sheets, sticking up and down again with drops of ghee and grease the sheets on the outer side as well. Now, smear a few drops of ghee to your palms and finger tips. 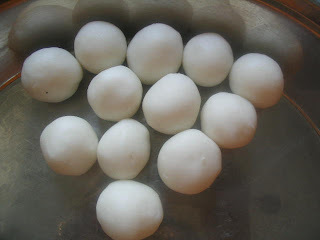 Take out a handful of warm rice dough from the casserole and roll them evenly into small lime sized smooth balls. 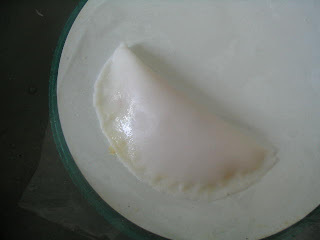 Keep one ball in the centre and press lightly to form a poori sized shape.Place the filling on the lower half, in a linear way. 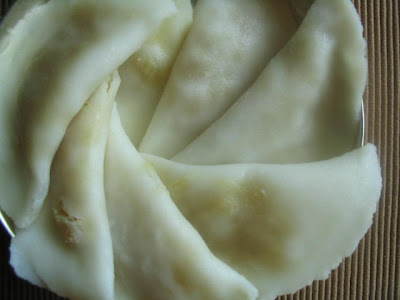 Fold carefully and press the edges lightly.Let your fingers be always greased with ghee so as to avoid any sticking of dough to the finger tips. Arrange them, steam cook for 10 minutes and you are done!. Pasipparuppu / Moong dal payasam. 1. Wash and soak raw rice in cold water for ½ an hour.Drain and grind well with coconut in a mixie, to a smooth paste, adding water.Keep aside. 2. 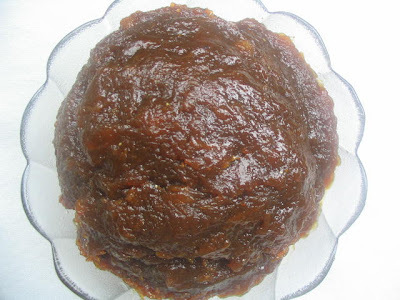 In a pan, boil the jaggery lumps with ¼ cup of water.Melt down the lumps.Boil for a few more minutes to attain honey consistency.Cool and filter impurities.Keep aside. 3. Boil 2 large cups of water in a heavy bottomed broad vessel.Add roasted moong dal. 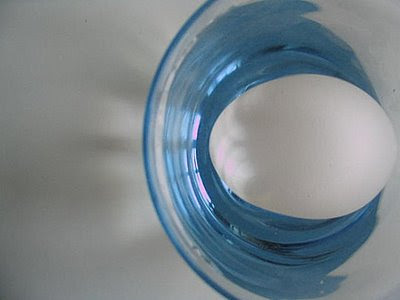 Keep the flame medium to avoid boiling over, stirring in between. 4. 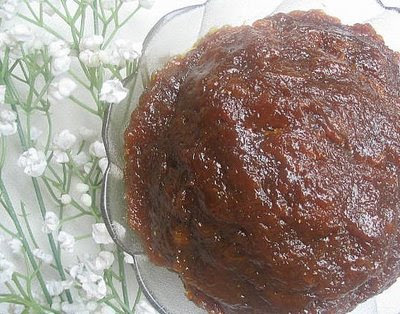 When 3/4th cooked, stir in the jaggery syrup.Let it boil well and after a few minutes stir in the rice and coconut paste.Stir continuously in medium flame to avoid lumps and bring to a boil. 5. The payasam might have got thicker by now.Add salt. 6. Add milk to attain the right consistency and boil again stirring all the time.Add cardamom powder and remove from fire.If you add coconut milk, add in the final stage and let not the payasam boil too much. 7. Add even more milk if you like the diluted version as the payasam tends to get even thicker once it cools down. 8. Garnish with roasted cashews along with its ghee. 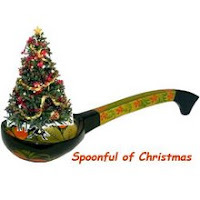 This is specially posted for dear "Lathamma" of Yum Blog for her Festival Cooking Series. 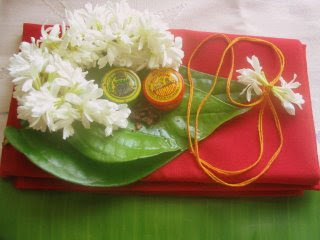 Also my submission to RCI-Tamil festivals hosted by Viji of vcuisine. JFI-Vazhakkai Pattinam Varuval / Crispy fried Raw Plantains. My severe hunt for the ripe bananas ended a sad demise as they are totally 'off' season here.I had always watched with envy and awe, the heavy trucks of T.N loaded with bananas heading to Kerala, where bananas are abundant, raw and ripe, year round, and me hunting for the same in the source point! !.I had wanted so much to whip up something with the ‘real fruit’ and now left with no other choice than the raw plantains. All I know about this raw plantain dish is that it originated from the villages of Tamil Nadu.Purely authentic, this is seen to be disappearing from the dining tables of the state!.Pattinam means a town or a city and Varuval meaning fry....and that's how the villagers have named you see..:)..
As the most of the recipes, I learned this easy to make dish from my ma in law. This goes to JFI- Banana hosted by Mandira of Ahaar. !. 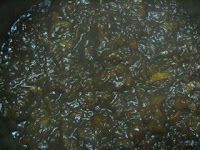 Remove the outer green skin using the peeler.Cut into small even sized cubes of 1cm each.Boil water in a pan adding salt and turmeric powder.Transfer the pieces to it.The water level should be just above the pieces and drain them when the water just boils and whirls round and they are ‘just’ cooked.Do not overcook. 2. Heat oil in a wide non stick kadai.Splutter mustards.Add the urad dal.Immediately add the boiled plantain cubes. (the urad dal aquires the deep brown colour during the whole process and you need not wait for them to get roasted while tempering). 3. Turn the pieces gently while getting roasted in the kadai every 3 minutes, keeping the flame steady to ‘medium’. They generally ‘drink’ oil quite well and within 10 minutes the oil must have been all absorbed!At this stage, they are half roasted, add the broken red chilly bits.Toss again and add the dried curry leaves(chillies and curry leaves are not added while tempering and are added half way to avoid getting over browned).Check salt. 4. After about 10 minutes the pieces would have turned golden brown and crisp.Toss and remove from fire. 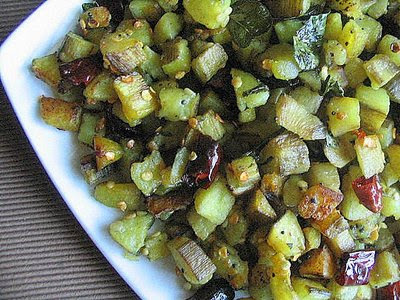 Serve hot with Rice and ‘vengaya sambhar’ or Rice and ‘vathal kuzhambu’…of course without counting the calories! :D..